When it comes to internet marketing, you have several options on hand. Content marketing and SEO are some marketing strategies that are quite affordable and yield good results. However, most people including marketing gurus consider PPC campaigns to be the most effective way of internet marketing. This shouldn’t come as a surprise given that a large number of people click on ads when browsing online. There’s also the added benefit of PPC offering immediate results making more and more marketers consider it. It is true – a strategically crafted PPC campaign can boost online traffic, provide more leads and ultimately provide more sales. The only problem with PPC campaigns is that they require a lot of strategic planning as they are somewhat complex. Also, PPC is a paid search which will require you to invest money upfront. You will only see results after your campaign has been setup and ads, are running. Now, a large number of people keep asking me if AdWords is a waste of money and if they should focus their marketing efforts elsewhere. Well, AdWords does cost money – but it can yield incredible results for you if you set up your PPC campaign properly. So, how do you go about running a successful PPC campaign? Continue reading this guide, and by the end of it, you’ll know just how to approach an AdWords campaign. Before you set up your AdWords campaign, you need to do some brainstorming. You need to do some research to find out what your customers are looking for and how they search for it. If you don’t do this and jump into your campaign, you will be targeting the wrong keywords. Needless to say, investing in the wrong keywords will mean spending money for little to no real conversions. Make sure to do adequate customer research to find out which keywords you should target in your PPC campaign. It is also a good idea to use online keyword tools to check the demand for the keywords you’re targeting. The Google AdWords keyword planner will help you find relevant keywords, and it will also show you valuable metrics such as the search volume trends, competitive data and cost per click of keywords you select for your campaign. Once you’ve gathered keywords that you want to target, you’ll need to organize and structure your AdWords campaign. For starters, you’ll need to organize your keywords and group related keywords together. This will allow you to create targeted keyword groups and it’ll make it easier for you to measure their performance. One thing you should keep in mind is that keywords can range from broad and generic to specific long-tail queries. Broad and generic keywords are associated with informational search queries while long-tail keywords are associated with transactional search queries. Remember this when you are creating targeted keyword groups. When you’re organizing keywords into groups, you may come across negative keywords. Negative keywords are those who may have attractive metrics, but they’re not ideal for your campaign. For instance, if you’re targeting a keyword like ‘Nike shoes’, ‘sneakers’ is also a related keyword. However, ‘sneakers’ is a very broad and generic keyword which may have a different search intent. If you include such keywords in your campaign, you’ll unnecessarily be paying for clicks that won’t result in conversions. Make sure to weed out all negative keywords from your AdWords campaign. When you’re organizing your keywords, you must also ask yourself if you have the budget to advertise for a keyword. Remember that several factors determine the average cost per click for keywords so you must know what you can afford and what you can’t. This is not a hard and fast rule to determine the max cost per click, but it gives you a reasonable idea of what to target. If you don’t focus on max cost per click, you’ll still be able to run an AdWords campaign, but you may not maximize your profits. Finally, to get the most out of your AdWords campaign, you must focus on creating brilliant ad copy. A well-written copy will allow your ads to stand out from the competition, leading to more clicks and more conversions. Your ad copy should be valuable and believable, it should include your PPC keywords, and it should address the risk-averse customer. Remember – your ad copy is your USP, something that will make you stand out from the competition. So, pay good attention to it. And, make sure to include a clear, relevant and powerful call to action with your ad copy. Use actionable words such as ‘now’ and ‘get’ to nudge people into clicking on your ads. 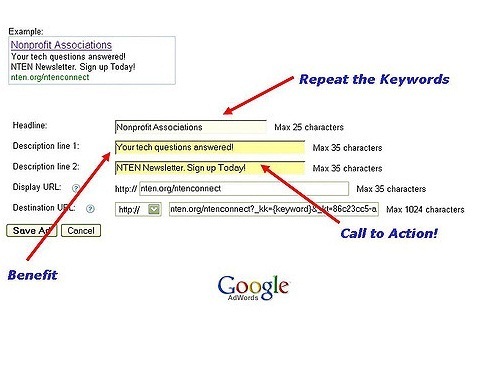 The right call to action can boost your PPC conversions dramatically. Depending on what type of ad you’re promoting, you can also consider using ad extensions. Extensions such as location extensions, app extensions, sitelink extensions, review extensions, structured snippet extensions and call extensions can all help boost your campaign. It’s not necessary to include ad extensions though. You can still create and run a very successful AdWords campaign without using any ad extensions. However, there’s no doubting that ad extensions will offer you more flexibility and control over your PPC campaign. So, there you go – these are some of the strategies that will help you run a successful PPC campaign. By following these strategies, you won’t waste your valuable marketing budget unnecessarily. These strategies will allow you to target the right keywords, make the most of your budget and achieve more clicks and conversions. Do you use any of these strategies in your AdWords campaign? Do you know of any great PPC strategies that I may have missed out on? Do leave me your thoughts in the comments section below and I’ll be looking forward to reading them!